Oldtimer technology and antiques traders area is marked with red colour. We don't book or sell places on a numerical basis. 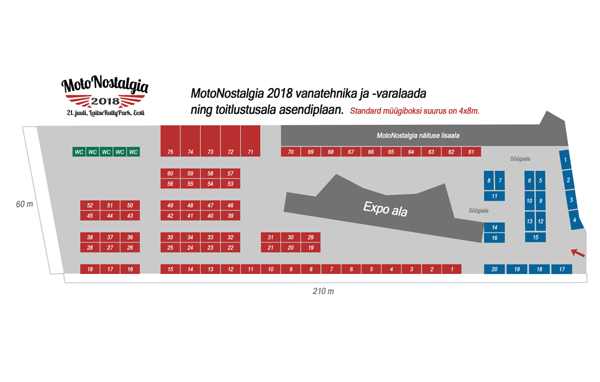 All places are drawn on the fairground area so you can pick a free space when you arrive at MotoNostalgia yourself. Specially booked places will be marked with security cones so we ask you not to use or move those! Catering area is marked with blue colour. These places will be booked on a numerical basis in cooperation with the caterers themselves. Click on the plan to see a larger view of the fairground (PDF format).